The 2XU Recovery Compression Sock is designed with anatomically correct left and right foot beds utilizing our newly designed footpads and arch positioning to provide maximum support for the foot in all sedentary positions. Enhanced circulation through powerful gradient pressure ratings and new venting panels on top of foot for added all day comfort. 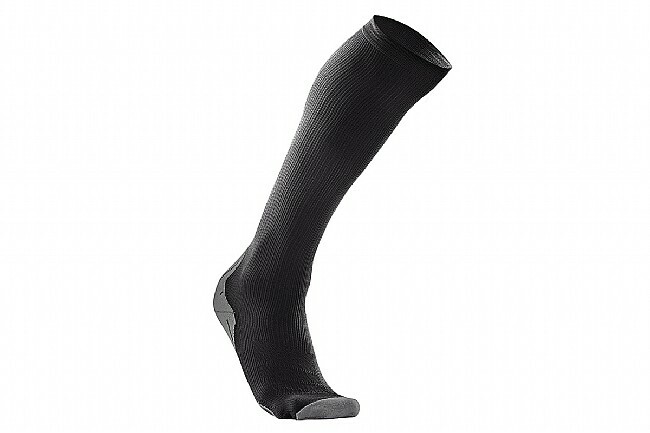 The 2XU Men's Recovery Compression Socks G2 are available in Black/Grey, in sizes Small – X-Large. Post-activity compression wear enhances recovery with stronger compression fabrics. Anatomically-correct Left/Right foot beds for maximum support. Versatile design suitable for everyday use. High-filament nylon yarn for durability and optimal moisture management. Calf Circumference 13"-14" 14"-15½" 15½"-16½" 16½"-18" 18"-19"